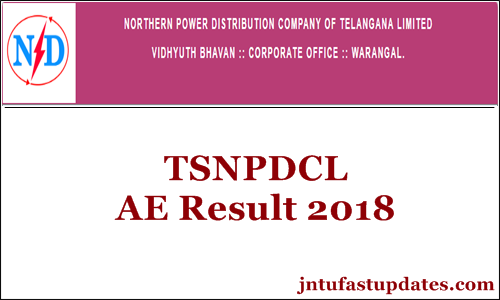 TS Assistant Engineer Results 2018, Score Card Download: Telangana State Northern Power Distribution Company Limited (TSNPDCL) has done with the conducting of Assistant Engineer (AE) examination on 15th July. Hopefuls who had applied for the TSNPDCL AE posts have taken part in the written test round with a great ambition to get selected for the AE posts. The organization has organized the test in many examination centers across the Telangana State. Candidates have competed in immense number for the AE posts. The organization has let the competitors check the Assistant Engineer answer keys soon after the examination completed. Candidates have checked with the answer keys and estimated the approximate score. Competitors waiting for the TSNPDCL AE results can shortly expect the results on its official website tsnpdcl.cgg.gov.in. Soon after the organization announces the result date, here we will update for the aspirants waiting to know. TSNPDCL AE cutoff marks and merit list will also be expected on the same date of results. Telangana State Northern Power Distribution Company Limited (TSNPDCL) is the state level power transmission department. The organization works for the enhancement of Power related operations in the state. It annually issues various recruitment notifications for the aspirants seeking state government jobs. This year the TSNPDCL has released the notification for 68 Assistant Engineer posts. The organization has announced 66 AE (Electrical) and 2 AE Civil posts. Many of the interested aspirants having the suitable eligibility to apply for AE Posts have applied from 13th June to 27th June. The TSNPDCL selects the candidates on the basis of their merit in written test and interview rounds. Candidates will be appointed on the basis of merit only. Appointed candidates will get a good pay scale of 41155-1700-44555-1985-54480-2280-63600 as per state government norms. Candidates have competed for the TSNPDCL Assistant Engineer on 15th July. Hopefuls competed for the test can soon check the result. Check more details from the following article. All the candidates who have appeared for the AE written test on 15th July can Download TSNPDCL AE Results 2018 from the official portal, Tnspdcl.cgg.gov.in. The Result is expected to release within 3-4 weeks after the examination (tentatively). Hence candidates who have appeared for the test can wait until the organization announces the result date. Keep checking the TSNPDCL official portal to download the result. Candidates have to acquire minimum cutoff marks as specified by the TSNPDCL to shortlist for the next round, personal interview. The TSNPDCL is going to release the list of qualified aspirant’s names in TSNPDCL AE merit list 2018. Aspirants can keep checking through the TSNPDCL Official website, Tnspdcl.cgg.gov.in to download the result, cutoff marks, and merit list. tsnpdcl.in – Is the official portal of TSNPDCL. Have a look at the page. TSNPDCL AE Result 2018 Link appears in this section. Click on the link. How to check merit list of ae npdcl 2018. My results not found. That shows as incorrect Hall ticket no., date of birth and name. I want to know my results.. I lost my my hall ticket no, how I know it!!? ?